“A community orchestra in the truest sense of the word” These words were written in the program of last night’s Brookline Symphony Orchestra. 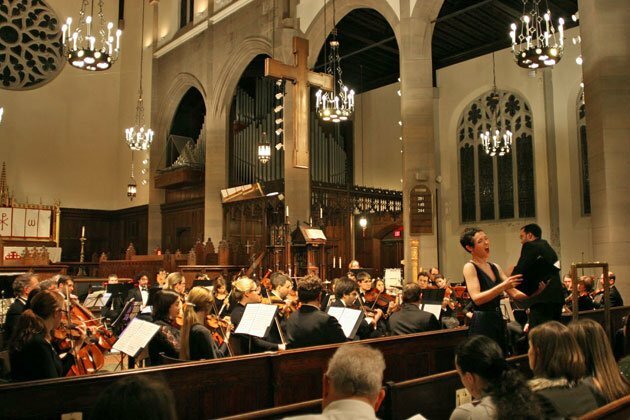 The orchestra has been hard at work trying to incorporate classical music into Brookline’s cultural life through numerous outreach initiatives since the 2010 revival of the organization which was originally created in the 1950s. As a fairly new resident to Brookline myself, I was excited on Sunday at All Saints Church to root for the proverbial home team. Earlier that day I read an article by Alex Ross about the state of music education in America. He discussed the outreach programs that almost all major symphony orchestras have incorporated into their normal functions while demonstrating the self defeating nature of classical music culture after being absorbed as a sort of hobby for the social elite. In the article, Ross quotes John Dewey who wrote, “. . . when an art product once attains classic status, it somehow becomes isolated from the human conditions under which it was brought into being.” With these thoughts in my mind it was refreshing to see a diverse audience, not the typical homogeneous blend of blue-haired socialites one normally sees at a symphony orchestra concert. There was none of the haughty indifference about this evening that can sometimes intimidate potential new concertgoers. It is a volunteer-based organization, an orchestra of the people, by the people and for the people. In attendance were excited children, proud parents, and friendly co-workers all there to see their orchestra’s second concert of the season. The evening opened with the Massachusetts premiere of Regatta (2004), an exhilarating piece by Austin-based composer, James D. Norman, it was written to convey the excitement and energy of a boat race. Regatta opened with muted brass which was soon accompanied by serene harmonics in the strings followed by a sustained tranquility in the woodwinds. Before long, the piece was racing ahead at a demanding tempo. The tinkling of metallic pitched percussion, which found heavy use in much of the 8-minute composition, evoked light glimmering off of the bouncing waters of the Pacific while tremolos in the strings acted the part of endless lilting waves. Copland-esque brass fanfares and whirling percussion brought the piece to an electrifying finish. Sea Pictures, an 1899 song cycle by Edward Elgar closed the first half of the program. Elgar was forty-two when he finally found success as a composer in the form of Enigma Variations which he followed shortly after with Sea Pictures. Contralto, Emily Marvosh, was the featured soloist for this collection of five songs, each relating to the sea and with text from different writers. Marvosh sang wonderfully, with ample strength in her low register and a graceful allure in her high range. The orchestra at times sounded so delicate accompanying her that it was easy to forget the power they could wield until a section’s return would remind the listener of the power of the ensemble. Mendelssohn was inspired to write his Symphony No. 3 after participating in a walking tour of Scotland in 1829. The ruins of the chapel at Holyrood Palace particularly inspired him, evidenced by a descriptive letter home which also included a sketch of the opening of the Symphony. The piece was not Mendelssohn’s attempt by to incorporate Scottish folk music into a traditional Symphony, but rather to re-create the impression which the Scottish landscape left upon the young composer. The opening of the Symphony conjures gloaming silhouettes of the Scottish ruins through a thick mist—a rather tangible image due to a comparable mist occurring just outside that very evening. The evening’s closer, Mendelssohn’s third (actually his last to be written, but third to be published), made the clearest case for conductor Adam Boyles’s talent. It was obvious he has a great set of ears and a good head for the music. He was very attentive to the orchestra, moving his focus from section to section as the music advanced, trying to get the most out of Mendelssohn’s orchestration and the players were responsive. Boyles gave an excited talk before the symphony, discussing its history and outlining his enthusiasm for the piece. It is important for a community orchestra to have a music director who is as engaging and enthusiastic as Boyles—it would be nearly impossible to become a “vital part of Brookline’s cultural life” with a standoffish and reserved conductor, no matter how talented he was. Although the orchestra is made up almost entirely of volunteers, Boyles challenges his players with stimulating programming. He also saw to it that there were comprehensive yet straight-forward program notes for last night’s performance, giving audience members who lack familiarity with symphonic repertoire a chance to enhance their understanding, and thus, appreciation, for the evening’s music. The ensemble is obviously capable and talented but lacked some of the visceral connection one would expect from a symphony orchestra, mostly due to the performance space. The sanctuary of All Saints Church is not meant for such an ensemble. Its high ceilings, along with the lack of a raised stage, and the absence of a wall immediately behind the musicians caused much of the sound that would normally be directed at the audience, to float up and away through the wooden rafters of the church. It is rather a pity because the orchestra can really play. Yes, a wondeful concert, and I fully agree with the review. I was not familiar with the Elgar, but was very glad to hear it performed so well. Like the reviewer I marveled at the ability of this large orchestra to accompany the soloist without ever making the words unintelligible. Kudos should also go to Marvosh for her excellent diction, and for her wonderful restraint with vibrato. She can hold a pure note as long as she wants to, adding just the right amount of color at the end. What a joy.